It’s Wednesday night…which means I’m on my own! Brandon is in a bowling league (seriously) on Wednesday nights so I get to enjoy a night of eating whatever I want and watching what I want on TV. Glorious! 🙂 Tonight I had leftover Coconut Red Lentil Curry, a salad and a chocolate chip cookie. It’s always some sort of meat-free feast! It’s been a very relaxing night. I took the day off from exercising because I haven’t had a rest day in over two weeks and I’m just tired and my body needs a break. I’ve started teaching a BodyPump class on Monday mornings at 6 a.m. and it’s been a big adjustment. The 5 a.m. wake up call is very early for me. I know I’ll get used to it but so far I feel like I start the week in a sleep deficit. The good thing is that I have a class full of people up early with me and they are ready to work! Yesterday I went to a hot vinyasa class at Y2 Yoga. I’m so sad that my one month unlimited “new student” pass is ending! My brother-in-law and his wife gave me a pass to try this studio for Christmas. Obviously, I’ve definitely been using the free month to its fullest extent! So now I have to make the decision whether to buy a 10 class pass or a month unlimited. There’s about a $25 difference in price. I’m just not sure which is the right fit. I know I’ve been all about the yoga lately but I’m starting a new half marathon training plan on February 1. I dont’ know if I can fit in teaching BodyPump, running 4-5 days a week and utilizing a month unlimited pass to it’s fullest extent? Thoughts? Okay…back to food. I’m sure you’re confused about the meaty pasta dish in the picture above since I’ve been going on and on about vegetarian dinners and working out. I made this dish on Monday night. 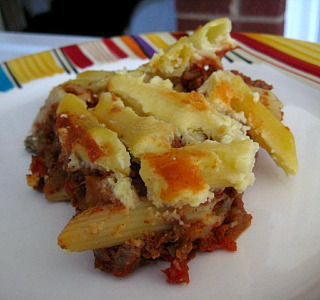 It’s a Greek dish – Lamb and Eggplant Pastitsio. I was craving eggplant and love Greek food so this recipe hit the spot. It was so good…the cinnamon added an awesome warm flavor to the lamb sauce and the nutmeg I added to the cheese sauce complimented it perfectly. Although it took a couple hours start to finish, the end result was totally worth it. And it’s not all hands on time – lots of simmering and baking time in there too. I thought the double layer was really fun – you mix the bottom pasta layer with the meat sauce and the top pasta layer with the cheese sauce. Yum! I’m so embarrassed to admit that we both went back for not only seconds but thirds! And we had the leftovers again last night. If you’re a Greek food lover this is a must try. And just a side note, I think you could sub beef for the lamb if you’re not a fan of lamb. Heat oil in a heavy pot over medium heat. Add onion and cook 3-5 minutes, until softened. 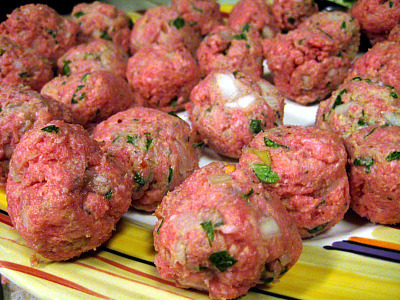 Add lamb and continue cooking over medium-high heat, stirring to break up lumps. Cook until no longer pink, about 5 minutes. Add garlic, salt, oregano, cinnamon, sugar and pepper and cook another 2 minutes, stirring frequently. Stir in eggplant and tomatoes. Gently simmer, covered, stirring occasionally, until eggplant is just tender, about 40 minutes. Remove lid and simmer, stirring occasionally, until sauce is thickened, about 15 minutes more. Season generously with salt and pepper. While meat sauce is simmering, melt butter in a small heavy saucepan over medium heat. Stir in flour and cook, stirring frequently, 2 minutes. Whisk in milk and add garlic clove and whole clove or nutmeg. Bring to a boil, whisking constantly. Reduce heat and simmer, whisking occasionally, 5 minutes. Add feta, salt and pepper and cook, whisking vigorously, until cheese is well incorporated. 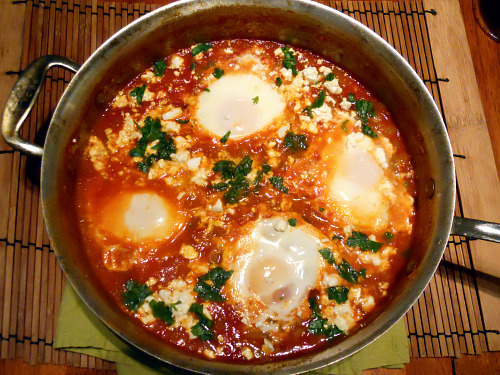 Beat eggs in a large bowl and slowly add sauce to eggs, whisking constantly. Cook pasta in a large pot of boiling salted water. Slightly undercook the pasta since it will finish in the oven. Drain in a colander. Toss half of pasta with lamb sauce and half with cheese sauce. Pour pasta with lamb sauce into a 9 x 13 baking dish, spreading evenly. 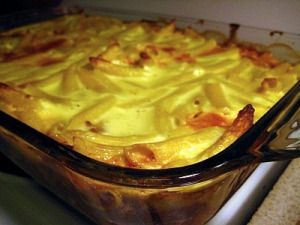 Spoon pasta with cheese sauce on top, spreading evenly. Bake uncovered, in middle of oven until bubbling and top is golden, 25 to 30 minutes. Let stand 5 minutes before serving. I mentioned a couple posts back that Brandon grilled a turkey breast on the Egg a couple weeks ago. I decided to make turkey chili with the leftovers since I knew a lot of people would be looking for ideas on what to do with leftover Thanksgiving turkey. I found this recipe from Gourmet. It was extremely easy to put together and was ready in less than 30 minutes. I will say the chili was better the second day after the flavors had more of a chance to blend. 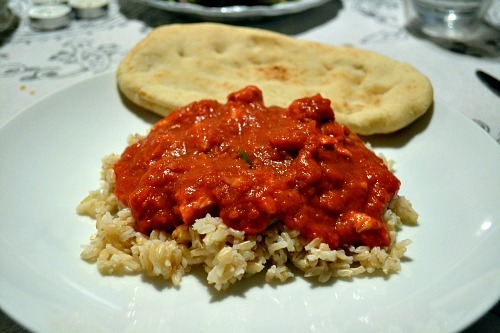 This recipe is a good starting place and you can really adapt it to whatever you have on hand. I think it would be good with different types of beans and also with corn added in. Heat a large pot over medium heat. Add olive oil and heat until shimmering. Add onions and peppers and cook, stirring frequently, for about 10 minutes, until golden. Add spices and brown sugar and cook, stirring, until fragrant, about 1 minute. If you are using whole tomatoes, cut with kitchen shears in can before adding to pot. Add tomatoes, beans, water and salt and simmer, covered, 15 minutes. Stir in turkey and cook for about an additional 5 minutes, until heated through. I was flipping through the July/August 2009 issue of Cooking with Paula Deen when I saw these Broiled Blue Cheese and Bacon Tomatoes. 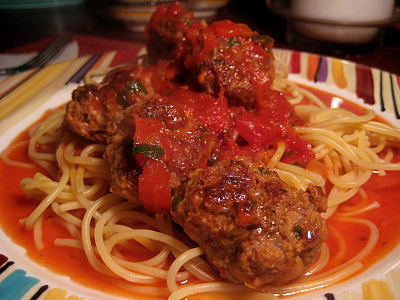 After I wiped the drool off the page, I promptly went to the grocery to get the ingredients for this recipe. I knew Brandon would be all about these too given his love for tomatoes, blue cheese and bacon. This is a perfect side dish to use those delicious tomatoes that are in season right now. These tomatoes totally lived up to my lofty expectations. I really like that you don’t scoop out the tomato goodness but simply top the tomatoes with the blue cheese and bacon mixture. It was just the right ratio of topping to tomato, still letting the flavor of the fresh tomatoes be the star. Preheat oven to 500 degrees. Line a rimmed baking sheet with foil. Combine cracker crumbs, blue cheese, bacon and green onion in a bowl. Add melted butter and stir to mix well. Place tomatoes cut side up on the baking sheet and sprinkle with salt and pepper. 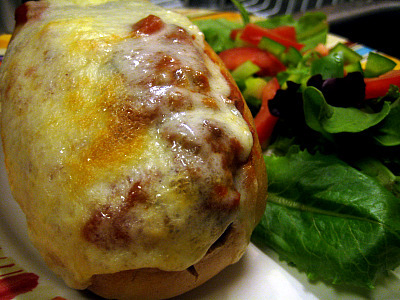 Divide blue cheese and bacon mixture evenly among tomato halves. 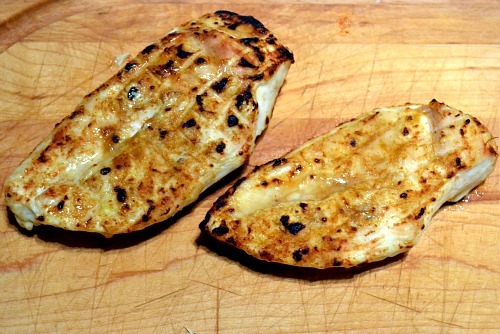 Broil, 5 inches away from heat for about 5-8 minutes, or until topping is lightly browned.